Worker militants from the greater Portland, Oregon area have come together to form Class Struggle Workers – Portland. We have been active and played leading roles in a number of area working-class struggles fighting for labor solidarity and independence from the capitalist state. We have also directly experienced the sorry spectacle of union “reform” groups that fail to defy the limits set by capital, its laws and politicians, and end up greasing the wheels of capitalist exploitation. In forming the CSWP, we answer the decades of decline and defeat of the labor movement by organizing a core of worker-activists on a class-struggle program that points the way to defeating the war on workers. 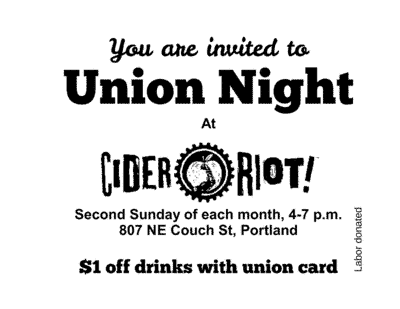 Founding members of Class Struggle Workers – Portland have been prominent in Cross Trades Solidarity, which sought to organize construction workers across craft-union divisions, insisting that picket lines mean don’t cross. We stood up to the “right to work” union-busters, while the AFL-CIO misleaders preached silence, and defeated the state’s retaliation against us. We have stood with militants who opposed the sellout labor bureaucracy while breaking with would-be union “reformers” who appeal to the bosses’ courts and labor boards. We insist: labor must clean its own house! We successfully fought for the 2012 May Day committee in Portland to take up the demands for full citizenship rights for all, for free contraception and child care, and for the 30-hour week for 40 hours pay. We also brought major local unions to the defense of anarchists in the Pacific Northwest targeted by FBI raids in the summer of 2012. And we sponsored resolutions passed by eight local unions calling for massive labor action to defend locked-out ILWU workers in Vancouver and Portland grain terminals. Earlier we helped build solidarity with the ILWU fighting the scab operation at EGT in Longview, Washington, participating in the December 2011 NW port shutdown while opposing anti-union views in the populist Occupy movement. Today the unions are being run into the ground by an ossified bureaucracy that took over in the “red purges” of the Cold War. Contracts that give up slightly less union gains than the bosses demand are presented to the thinning ranks of our unions as “victories.” Labor “progressives” publish how-to guides on negotiating giveback contracts. In Wisconsin and elsewhere, the bosses and their politicians are on the warpath, driving closer to an outright ban on worker organizing. Yet Wisconsin workers occupied the state capital as hundreds of thousands took to the streets, week after week. A general strike was a real possibility, but the workers were betrayed by “progressive” labor bureaucrats who sold out to the Democrats. This sums up why we have decided to form Class Struggle Workers – Portland: to fight for a leadership of the labor movement based on a class struggle program. It’s necessary to draw a balance sheet of four decades of union reform movements in this country which have failed to reverse the decline of the labor movement. Where they have taken power in the unions, they have sold out the ranks just as treacherously as the old bureaucracies that they replaced. Since they appealed to the bosses’ state, its courts and labor laws, the government owned them. Since they refused to oppose the capitalist Democrats, the “reformers” guaranteed in advance that they would capitulate before strikebreaking by these phony “friends of labor,” as in the settlement of the 2012 Chicago teachers strike. Many of them endorsed Barack Obama, who called out the Coast Guard against the ILWU in Longview; the rest kept their lips zipped. In the face of unrelenting capitalist attack, the policy of building opposition groups in the unions based on vague calls for democracy and militancy is bankrupt. By avoiding fundamental class issues, they just serve as vehicles for bureaucrats-in-waiting. Talk of “fightback” is not enough: what’s needed is a strategy to win the class war. Millions-strong unions were built by class struggle in the 1930s, forged in bloody battles with cops and strikebreakers. It will take no less to defend workers’ rights today. Labor’s gotta play hardball to win! For total independence from the government of capital, its agencies, courts and the web of anti-labor laws. The class-collaborationist bureaucracy must be ousted by a fight for class-struggle politics within the unions: building pseudo-radical “alternatives” on the sidelines won’t do the job. Class-conscious unionists refuse to sue the unions, and oppose all interference by the capitalist state in the workers movement. We defend the unions against capitalist attack. Employer/government hands off union finances. Police, prison guards and security guards are the armed fist of capital, part of the apparatus of anti-labor, racist repression: they must be removed from the unions. For united labor action and industrial unionism. Any real struggle for union democracy requires a clean break from the capitalist state. For the election and recall of all union officials by majority vote of the membership. Wages of union officials and staff should be no higher than an average worker’s wage. No to secret negotiations with employers. Elect mass strike committees of delegates recallable by the ranks at any time. Picket lines mean don’t cross, period. Rip up anti-union injunctions and the slave-labor Taft-Hartley law by building massive picket lines that no scab dares to cross. Down with the two-gate system in construction and craft union divisions everywhere. For a single industrial union of construction workers. No race-to-the-bottom raiding. For real wall-to-wall contracts, closed shops, and union hiring halls. For union safety committees with the power to stop work. No non-union contractors or management doing our work. Organize port truckers and respect their picket lines, no matter what the bosses’ arbitrators say. Scab cargo is too hot to handle. Instead of powerless consumer boycotts, for active labor solidarity to bust the union-busters. Mobilize against anti-labor “right to work” forces. Organize the unorganized. Despite their super-sized talk about fast-food and other low-wage workers, the present labor leadership only “organizes” them to stage small-fries rallies for capitalist politicians. Labor must use its power to shut down businesses that refuse to grant these workers a massive wage increase and union recognition. Strike at mass unemployment by fighting for a shorter workweek with no loss in pay, and a massive program of public works under control of the workers. Make affordable housing a reality: expropriate the landlords, convert the property of the super-rich into public housing. Fight racism, defend the rights of African American, Latino, Asian and other oppressed people. Smash the racist death penalty and the neo-slavery of mass incarceration. Eliminate all drug laws, which are a tool of racist repression. Mobilize labor’s power to free Mumia Abu-Jamal. For free, quality, integrated secular public education from pre-K to graduate school. Unions should recruit and train workers from oppressed communities. For strikes and workers mobilization against police terror and brutality; organize labor/black/immigrant defense guards to sweep fascist scum off the streets. Fight sexism, defend the rights of women. For free, high quality 24-hour child care. For full reproductive rights, including free abortion on demand as part of a socialized universal health care system. For labor defense of abortion clinics against reactionary terrorists. No discrimination against gays, lesbians or anyone on the basis of their sexuality. Church and state out of the bedroom. Oppose imperialism, defend immigrants, for international workers solidarity. Fight racist discrimination and anti-immigrant prejudice in our unions. Mobilize labor’s power to stop deportations. Full citizenship rights for all immigrants. For union action to stop I-9 and “no match” firings and ICE factory raids. No to racist “English-only” laws or rules. For workers action against imperialist war: political strikes against the war, “hot cargo” war supplies. Oppose flag-waving appeals by the labor fakers. For active labor solidarity with the Palestinian people. Oppose U.S. occupation of Afghanistan and Iraq, and war threats against China, Cuba, North Korea or Iran.